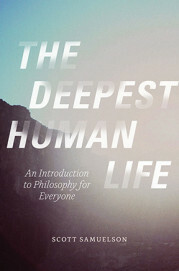 With The Deepest Human Life, Scott Samuelson adds to the steady output of philosophy books aiming to return philosophy to its core motivations: “This book is my attempt to bring philosophy down from its ethereal theorizing and put it back on the earth where it belongs, among wrestlers and chiropractors, preschool music teachers and undertakers, soldiers and moms, chefs and divorcées, Huck and Jim—you and me, in fact.” A passage such as this risks making philosophers out as having absconded with the “love of wisdom” for deviant purposes (publication, tenure, elitism, etc. ), but we needn’t disparage professional philosophers to say that much of their work is not relevant to what the democratic “we” are looking for—namely, sound advice on how to live. The primary reason there are so many books like The Deepest Human Life—just in the past few years we have James Miller’s Examined Lives and Astra Taylor’s Examined Life (not to mention, going back to 1990, Robert Nozick’s The Examined Life), as well as Jim Holt’s Why Does the World Exist? and Sarah Bakewell’s How to Live, to name only a few of the most well-known titles—is not that we’re still awaiting the knock-down argument that will win philosophy back from “them”; it’s that in each iteration of this sub-genre we as readers are presented with models for how we might philosophize for ourselves, assuming as these books rightly do that to do philosophy is part of what it means to be human. Not philosophizing, after all, is merely to philosophize badly. The approach Samuelson takes to make his introductions is to overlay a history of philosophy with a series of questions central to the era (e.g., “What is philosophy?” “What is happiness?”) that he colors with anecdotes from the classroom (he is a Ph.D. and a professor of philosophy at a community college). About half of The Deepest Human Life is devoted to the Greeks. Samuelson, like many democratizers before him, begins with Socrates and uses a healthy share of his ink on the Hellenistic philosophers the Epicureans and the Stoics, who tended to orient their philosophies explicitly around issues of human flourishing, and who are frequently neglected in the academy. Do you find that most of life’s problems can be solved with a little creative shopping? Is television your primary form of entertainment? . . . Do you find that there’s just not enough time in the day, especially for things like exercise? Are you tired right now? Despite this constant lack of energy, do you believe that everything will work out in the end? . . . If you answered “yes” to most or all of these questions then you might be suffering from an illness called phobosophitis, or, as it’s known by its more common name, the zombie disease. The Deepest Human Life offers us the kinds of tools we have always needed to face Pascal’s implicit challenge to face ourselves, difficult though the task may be. As Samuelson writes, “We go on the journey of philosophy, the search for wisdom, despite what is comfortable, despite what is sensible, often into the depths of our loneliness—impelled by the force of a truth we don’t even know, but that somehow we know we must know."